Chrysanthemums are native to Asia and have been grown in China for culinary and medicinal purposes since at least the 15th century BCE. As an herbal remedy, chrysanthemums have been used to relieve headaches, reduce fever, alleviate chest pain, lower high blood pressure and treat diabetes. The flowers and leaves are used in a variety of dishes and herbal teas, mum petals are pulverized and used as an effective insecticide, and this herbaceous perennial continues to play an important role in Asian art and certain celebrations. Arriving in the United States in the late 1700s, chrysanthemums are primarily grown for ornamental purposes here and have become a common gift plant that is readily available at nurseries, flower shops and even grocery stores. This may be at least partly due to mums coming into fashion as a gift indicating friendship and well wishes during the Victorian Era. Chrysanthemums come in hundreds of varieties that range in size from about one foot to about five feet and come in an array of colors, including white, yellow, red, pink, lavender, purple, maroon, and orange. There are so many types that differ so greatly, folks who are not familiar with mums often think that different varieties of mums are not related at all. While some varieties have simple, daisy-like flowers, some have petals that look more like spider legs, and others have blooms that look like perfectly coiffed bird feathers curving down towards the stem. The National Chrysanthemum Society has considered this vast array of petal shapes and arrangements and has grouped chrysanthemums into 13 classes, including Irregular Incurve, Reflex, Regular Incurve, Decorative, Intermediate Incurve, Pompon, Single and Semi-Double, Anemone, Spoon, Quill, Spider, Brush or Thistle, and Unclassified or Exotic. For the most part, you will be looking for hardy mums for your garden that fall into a smaller group of classes: Single or Semi-Double, Anemone, Cushion, or Decorative. The other classes of mums are more difficult to find and more difficult to maintain. In most parts of Southern California, you can plant mums any time of the year. If you live in an area where winter temperatures dip near or below freezing, it is best to plant them in spring so that they have plenty of time to become established before they have to deal with weather that is hotter or colder than they prefer. When planting mum seeds, start your plants indoors six weeks to two months before the last frost or directly in the ground after the last frost in spring. When planting from cuttings, it is best to plant them in late spring or early summer. Ideally, you want to plant mums in an area that gets plenty of morning sun and away from areas that are lit at night by streetlamps or porch lights. The morning sun will help dry any moisture accumulated overnight. Keeping your mums out of the light during the night will help your plants recognize when the days are getting shorter, which tells them when it is time to start blooming. Should I Grow Chrysanthemums from Seeds, Cuttings or Potted Plants? If you plan on growing chrysanthemums from seeds, you can expect it to take about four months for the plants to mature enough to produce flowers. You can start them indoors in seed trays in early spring, then move them into the garden after the last frost. This way, they will already have a few weeks to germinate and develop, which will allow you to enjoy blooms in a shorter period of time once they are in your flowerbeds. It is also important to note that there may be some unexpected color variation when growing mums from seeds, so if you are particular about which color you want in your garden, you may be better off growing mums from cuttings or potted plants. Potted mums are a popular gift, which means there are plenty of folks wondering if they can transplant this type of potted mums into their garden. The first thing to know is that these potted mums available at nurseries, flower shops and grocery stores for cutting and quick, easy gifts are usually not particularly hardy varieties. This type of mum is best enjoyed indoors, which is where it will survive the longest. If you choose to plant it outside, treat it like an annual, since you can expect to get blooms through the summer and fall, but your plant will die back when the temperature drops and will not come back in the spring. However, if you purchase hardy mums in containers from a local nursery or garden center, you absolutely can transplant them into your flowerbeds without an issue and expect to enjoy them for years to come. Many gardeners prefer to plant from containers to give their garden a significant head start with plants that already have flowers. Growing chrysanthemums from cuttings is an inexpensive way to propagate mums and expand your garden, but it does take a little patience and effort. You can acquire mum cuttings from your existing chrysanthemums or from established plants at a friend or family member’s house. This allows you to essentially grow mums for free, although you may want to purchase some rooting powder at your favorite garden center to help your cuttings take root. Most home gardeners have the most success and enjoy their mums the most when they grow them from cuttings or transplant hardy mums purchased in pots. To grow mums from seeds, you can either start them indoors and later transplant them to your garden or you can sow the seeds directly in your flowerbeds. If you live in an area that freezes, you can plant mum seeds in the ground after the last spring frost, and then wait approximately four months for them to mature enough to begin producing blooms. Alternatively, you can start them several weeks before the last frost by planting them in seed trays or small containers indoors to later be moved to your garden. This does not save time, since it will still take four months to go from seed to flowering plant, but it does allow you to give them a big head start, which means you can begin enjoying colorful blossoms earlier in the year. Most gardeners choose to start their seeds indoors in seed trays or small seed-starting containers. To do this, fill each container (or spot in your seed tray) with sterile potting mix. Add a few chrysanthemum seeds and gently cover them with a thin layer of soil. 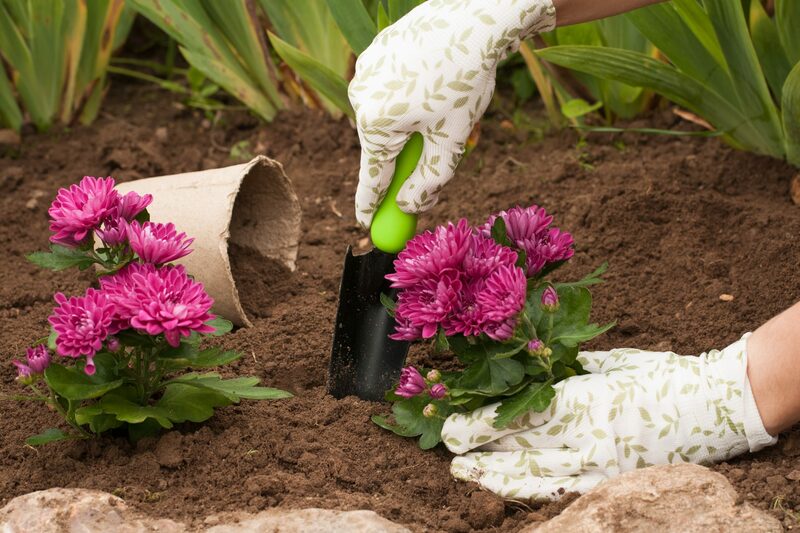 Use a dropper or turkey baster to moisten the soil with water without splashing and making a mess. Set your seed pots near a sunny window, ideally in a room that can stay right around 70 degrees. Make sure your soil is consistently moist for the first 10 days to two weeks. After you begin seeing sprouts coming through the soil, you can allow the soil to dry out a bit more between watering. You will notice more than one seedling coming up in each pot. Once these are large enough to easily cut with kitchen or garden sheers or a sharp knife, begin thinning them to produce fewer, stronger seedlings to transplant. Once the last frost of spring occurs, you can transplant your seedlings into your garden. If you live in an area with colder weather, you may want to start placing your seed pots outdoors during the day and bringing them in at night before transplanting them to allow them time to acclimate. Just a quick reminder: As mentioned above, you may not get the color you are expecting when you grow mums from seeds. Due to cross-pollination, mums sometimes look nothing like their parent plants. When taking cuttings from established plants, choose healthy shoots of new growth that are at least three inches in length. Use sheers or a knife to cut them from the plant, and then remove leaves from the bottom one to two inches of the stem. Place each of your cuttings about one-half inch deep in a tray or seed pots filled with perlite, potting soil or peat moss. While it is not absolutely necessary, you may want to dip the stems in rooting powder to help your plants get a good start. Keep the soil moist until the roots develop, which will happen within one to four weeks but usually happens by about two to three weeks. Once the root system takes hold, you can allow the soil to dry out a bit more between watering. To encourage fuller plant growth, pinch off about one-half inch from the top of new shoots once the cutting is rooted in the soil. Once your cuttings take root, gently transplant them into larger pots to allow the root system to expand for at least one more month before transplanting your new plants outdoors in your garden. Many gardeners prefer to purchase established mums in containers to transplant into their gardens. If this is your chosen method, simply dig holes about twice the size of the pot and plant your mums about 18 inches to two feet apart, depending on the variety. If you are planting in the ground in the clay soil found throughout much of the San Diego area and Southern California, you will want to mix in some compost to add nutrients and improve drainage. Fill the holes around the plants, give them a good watering, and prepare to enjoy some colorful blooms in late summer and throughout the fall. Keep in mind that mums have shallow root systems, so be sure to plant the root ball just below the soil surface. Once established, chrysanthemums require little care aside from regular watering and deadheading. Once the blooms are spent in late fall or early winter, you can remove the dead flowers, and then either leave the plant as is over winter or cut it back to a few inches above ground level. Most gardeners choose to cut it back and add a layer of mulch around the base of each plant to help it get through winter and prepare for it to come back strong in spring. Most mum growers also like to encourage fuller, bushier growth by pinching back the tips on new stems until the middle of July. Then, you can allow your mums to grow on their own for the rest of the blooming season. Feed your mums about once a month with a small amount of granular or a water-soluble fertilizer during the growing season. Chrysanthemums grow well in containers, which is a good option for gardeners living in areas with colder winters. When growing mums in containers, bring your mums indoors after the first frost and take them back outside after the last frost in spring. While mums can be grown as annuals or perennials, you should select hardy perennial varieties for your flowerbeds and borders. 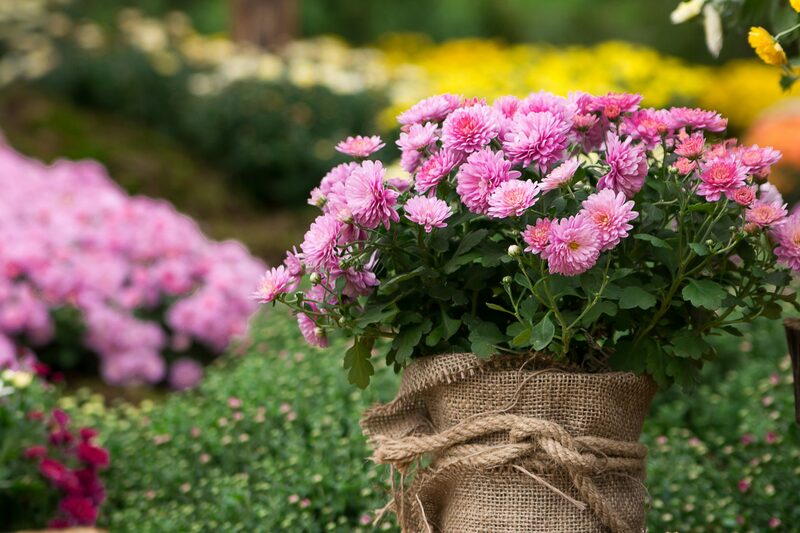 Once your plants are established, you will want to divide them every few years, which helps you avoid overly woody plants and provides you with more chrysanthemums that you can continue to divide and plant over the years to always have a supply of healthy mums. 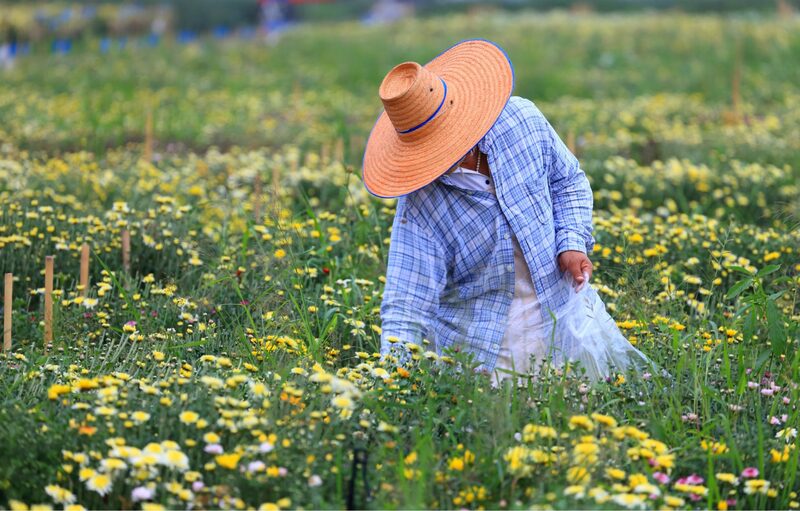 Dividing chrysanthemums is a simple process that is done in spring. Once you see a couple of inches of new growth on your mums in the spring, dig up the entire plant. You will then use a sharp knife to cut through the root ball to create three or four separate plants. If some divisions are rather woody, add those to your yard waste bin or compost pile, but save the healthy divisions to replant in your yard. Dig a hole that is about twice the size of the root ball of your division, add some compost, place your division in the hole so that the root system is near the soil surface, and cover it with soil. Water it well and feed it with a small amount of fertilizer about once a month. Are Chrysanthemums Toxic for Dogs and Cats? Mums are toxic to dogs, cats and horses. Even if they do not eat them, mums can cause skin irritation simply by coming in contact with your pets while they walk by or play near the plants. If you suspect that they may have eaten some of your mums, the American Society for the Prevention of Cruelty to Animals (ASPCA) says to look out for vomiting, diarrhea, incoordination, hypersalivation, and dermatitis.